My MAC Monday choice this week is one of those products that doesn't look like much on its own. But its one that I find myself using all the time and it is now one of my staples. When I first started putting together my MAC Eyeshadow Palette I was searching for core eyeshadow recommendations. One that came up repeatedly was MAC's Soft Brown Eyeshadow. I do love neutral colours for my eyes but I find cool tones such as greys and taupes quite hard to wear on their own. I naturally have dark circles under my eyes and darker eyeshadows and grey tones can just make me look tired, or even worse like I've walked into a door. In order to make these colours work for me I needed a warmer shadow to blend them with. Having Googled suggestions for a warm brown shadow it was MAC's Soft Brown Eyeshadow that seemed to fit the bill. It is a matte shadow in a peachy warm brown which can be worn alone or used in the crease or as a transition colour to add warmth to a look. 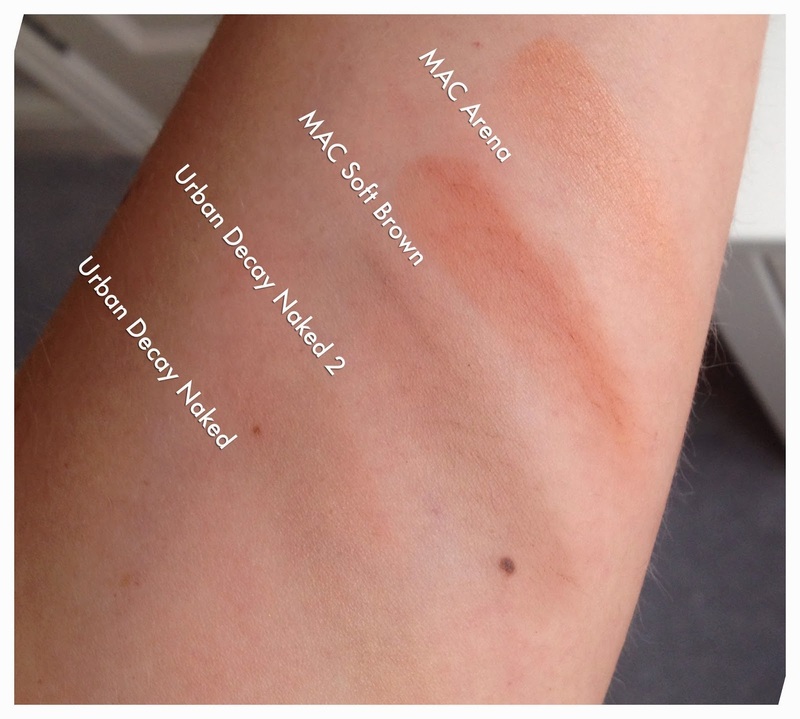 I read a fantastic post by Eyeshadow Addicts Anonymous (HERE) specifically about the best MAC Eyeshadow transition colours and Soft Brown was one. Off I trotted to my nearest MAC counter - only to discover that MAC Soft Brown was now discontinued in the UK!!! Worse still they couldn't offer up a decent dupe for it either. The trip wasn't a complete failure as I did actually come away with a beautiful warm shimmery eyeshadow called Arena. Arena is a satin finish eyeshadow that looks gold in the pan. It is a beautiful warm shadow that is subtle enough for daytime and you can add depth to the crease or corners with a slightly darker shade such as MAC Soba. If you want to see all the shadows together the fantastic Temptalia has a great post, swatching the different MAC brown eyeshadows HERE. But there was no avoiding my need for a matte shadow in a warm brown colour. I went through my Urban Decay Naked Palette and the Basics Palette but there wasn't anything comparable - everything was too cool toned or too dark. In the photo above I have swatched Soft Brown with Arena, Naked from the Urban Decay Naked Palette and Naked 2 from the Urban Decay Naked Basics Palette. Arena was the only shadow which had the right peachy gold tone to lift my complexion, but I needed a matte shadow to use as a transition colour. MAC Soft Brown eyeshadow is still available in the US but I couldn't find a US store that delivered to the UK. But then didn't want to pay astronomical postage either! As I mentioned in my MAC Monday post about Cranberry eyeshadow (HERE) I prefer to buy MAC Eyeshadows in the Pro Palette format to slot into my existing palette. I had a look at Ebay and there certainly were some sellers offering Soft Brown in this format, but I really wary of buying a fake. Having read Accidental Beauty's enlightening post about avoiding MAC fakes on Ebay (HERE) I was feeling quite cautious, so her later post on MAC Ebay sellers to trust (HERE) was a godsend. From the recommendations on her list I ended up buying Soft Brown from Rock the Catwalk for the equivalent of around £12 with free delivery from the US. This was a few months ago and I don't know if the store is still operating as the website just has a holding page at the moment. My eyeshadow arrived quite quickly and I have been loving it ever since! Just as I had hoped - if I choose a grey or darker shadow to use on the lid, I can blend it with Soft Brown in the crease. This really warms up the look and makes it more wearable for me. Soft Brown can look quite bright and scarey in the pan but it really is quite subtle on the lid. I am yet to find a dupe from other brands widely available in the UK - so I only wish I had bought 2! You can find MAC Pro Pan Eyeshadows HERE (including Arena). The Urban Decay Naked Palette HERE and the Urban Decay Naked Basics Palette HERE. Don't forget, if you want to join in MAC Monday send or tweet me your links (#MACMonday) and I will link to them here! I don't think I would ever trust a eBay seller with high end make up. So many fakes out there!! Love the colour of Arena though, such a pretty shade and really multi use too! I know, it is a gamble especially when the prices aren't any cheaper. I get the impression some fakes are so good you wouldn't know. If anyone knows of reputable overseas companies that ship to the UK then do let me know!! 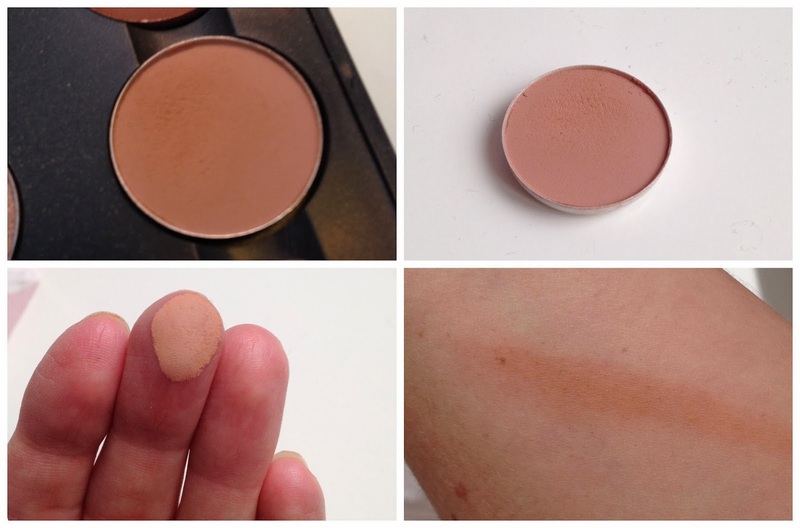 A good dupe for MAC Soft Brown is Makeup Geek's Creme Brûlée - amazing quality, and they ship worldwide!